In her 12 years of service, Cunard Line’s Queen Mary 2 has sailed 1.78 million miles. That is enough mileage to travel to the moon and back more than four times. No question that Queen Mary 2 is a workhorse, frequently sailing transatlantic cruises between Southampton and New York. 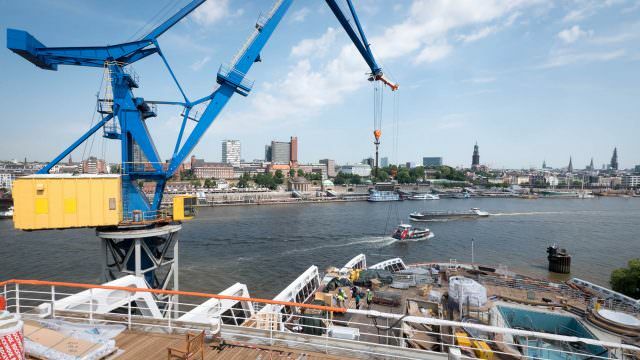 She is also a lady, and one who is getting an extensive makeover this month in Hamburg, Germany. Think of it as the ultimate spa treatment, one that is fit for a queen. 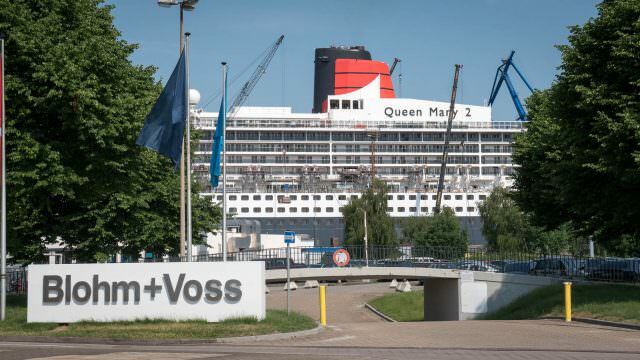 Last week, I was fortunate to be among a press group touring Queen Mary 2 at the Blohm & Voss shipyard, situated on the Elbe River. 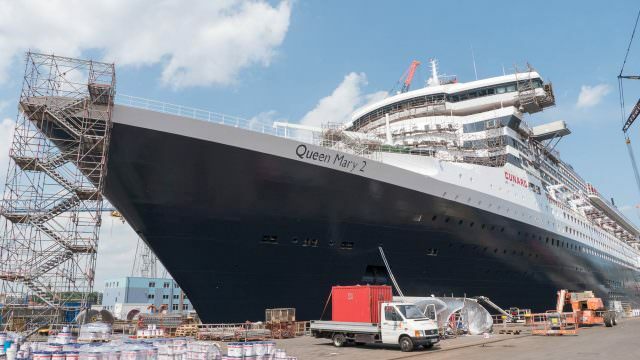 Cunard has yet to reveal the cost of the 25-day project, which the company says it will do once the refit is completed on June 21, but suffice to say that with 2,500 contractors and 1,500 yard workers, the investment is significant. Seeing the “remastering” in action was fascinating. We were taken to the shipyard where we donned visitor name tags and hard hats before entering the bowels of the ship on a gangway that spanned a space full of scaffolding within the dry dock. Queen Mary 2 is not touching water at this point, and we could see the ship’s giant propellor shafts and its massive hull. The ship was functioning almost as if it was in service. Our name tags were scanned by security. As we entered the ship we were greeted by the iconic Cunard Bell Boys who represent the company’s White Star Service. We’d see them all throughout the day, distributing cold wet hand towels and inviting us into some of the public areas. As we moved onward, we were welcomed with glasses of champagne (or fruit cocktails and other beverages). 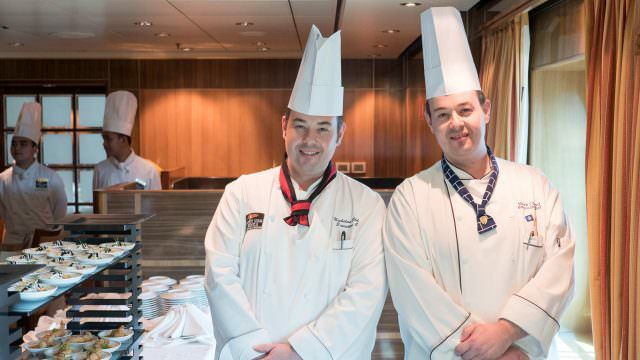 Cunard’s culinary team had prepared sampler dishes, dressed in their normal chef’s attire. We learned that they were preparing 17,000 dishes daily for the crew and contractors on Queen Mary 2. On a 25-day project, that’s 425,000 dishes, quite a feat when you think about it. Some of the food goods had to be stored in refrigerated containers on the upper decks. The process of managing the project was almost as impressive as the refit itself. Imagine what it takes to coordinate 2,500 workers and crew. And now there was a press group moving through as construction was taking place. Kudos to Cunard for managing such a massive project. What we saw was a construction site. Most of the rooms were filled with scaffolding and/or workers. Accordingly, there are no photos in this post depicting what the finished Queen Mary 2 will look like. Rather, the photos here are intended to give you a feel for the impressive scope of the project. 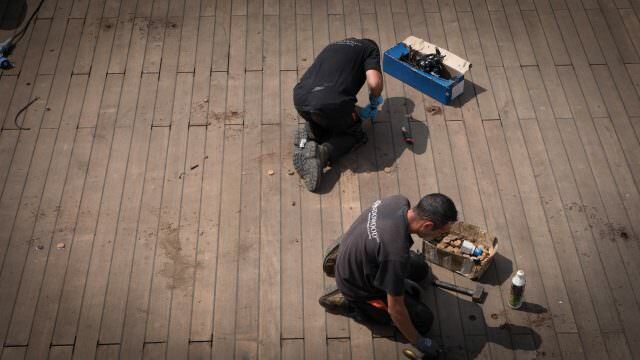 Some areas of the ship are being replaced. 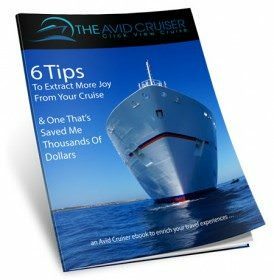 Gone, for example, is Todd English, which was Cunard’s specialty restaurant located on Deck 8 aft. The space will be rebranded as The Verandah, and it will open exactly 80 years after the first Cunard Verandah Grill went to sea on the Queen Mary in 1936. 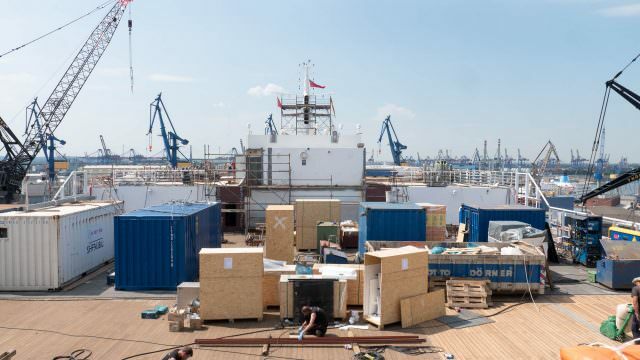 The new dining venue will evoke the special personality and flavor of French regional cooking with seasonal influences, while still maintaining the unique viewpoint overlooking the ship’s stern decks. Also gone is the Winter Garden. The space will become the new Corinthia Lounge, which will feature a dedicated patisserie and an afternoon tea service, with the option of a special Veuve Cliquot Champagne Afternoon Tea experience (this used to be held in the Veuve Cliquot Champagne Bar on Deck 3). When the sun sets, the atmosphere will evolve into an inviting evening spot with premium wine, small plates and relaxed entertainment. 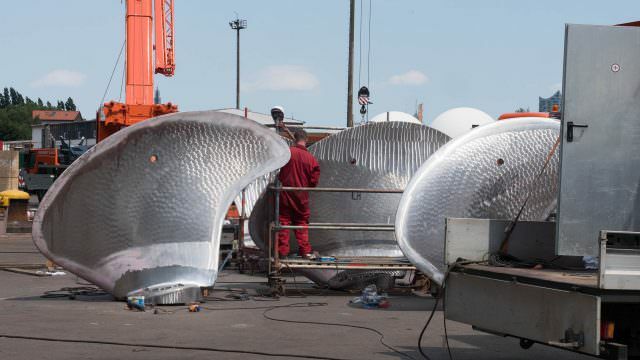 During the 25-day dry dock, the Princess and Queens Grills also will undergo an extensive restyling. 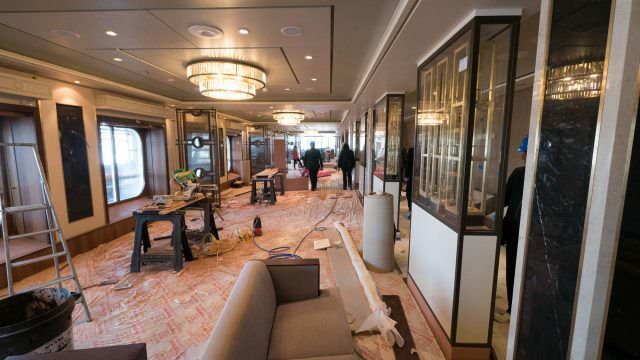 The new styling will include subtle references to Cunard’s history, including muted tones and elegant textures along with new carpet that features design work inspired by the original Queen Mary. The Grills dining experience will include a new color scheme, furnishings, added intimate tables for two, increased space between tables for intimacy and new culinary options. 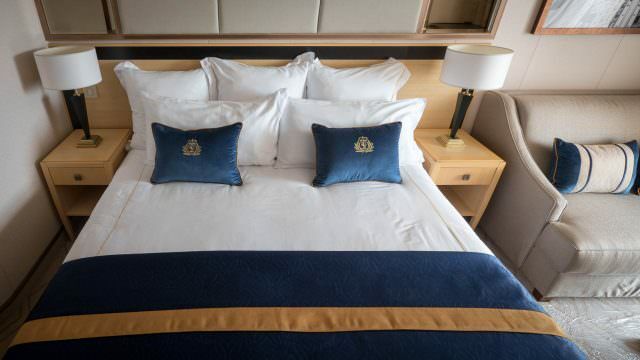 New staterooms are being added, including 30 Britannia Club Balcony Staterooms measuring 238 square feet each and five Standard Inside staterooms measuring 153 square feet each. 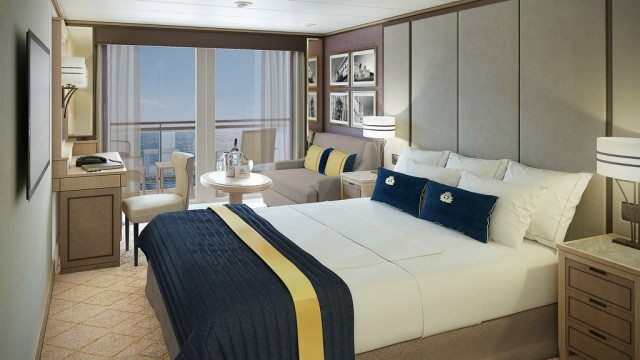 Rendering of the new Britannia Club Balcony staterooms on Deck 13. Rendering courtesy of Cunard. 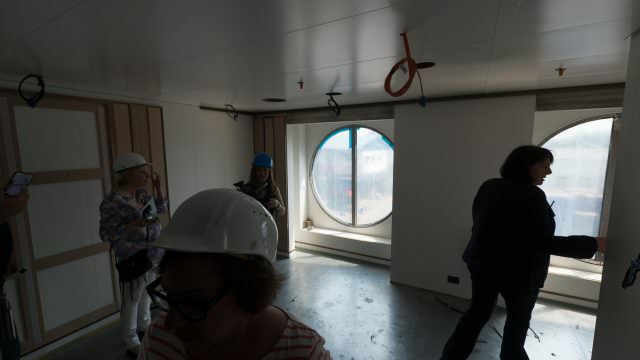 In addition there will be new single staterooms, six measuring 178 square feet each and featuring large circular windows with bench seat cushions and a central dressing table console. Though we saw only the rooms under construction, they were extremely attractive. I particularly liked the windows. 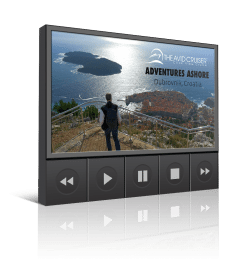 Another nine single staterooms, measuring 183 square feet, are being added. 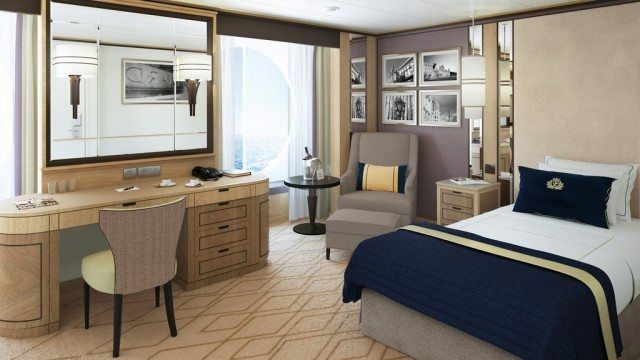 Rendering of one of Cunard’s new Britannia Single Staterooms. Rendering courtesy of Cunard. While human guest capacity increases, from 2,620 to 2,961, four-legged capacity also increases. The ship’s kennel will double in size during the refurbishment. 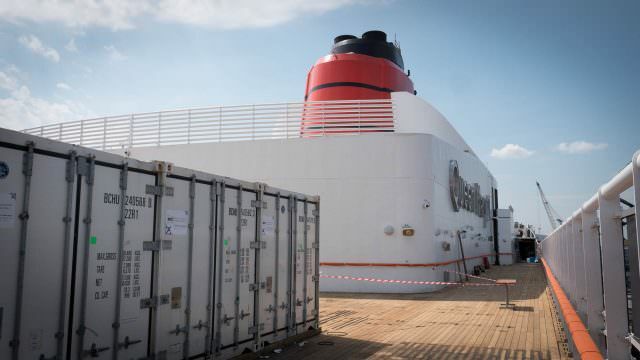 Ten new kennels will be added to Queen Mary 2’s uppermost deck, expanding the total number of kennels aboard the ship to 22 from 12. Both dogs and cats can sail on Transatlantic Crossings, and the existing 12 kennels sell out well in advance, according to Cunard. 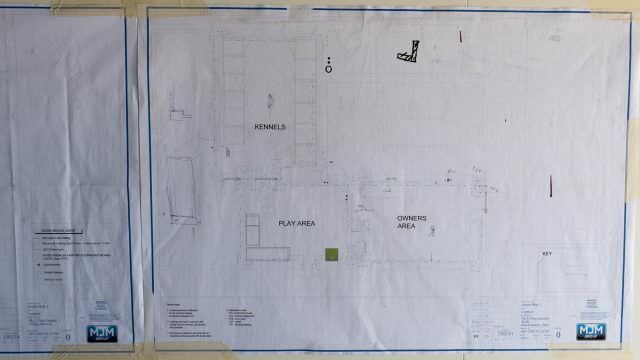 The kennel refurbishment will include a new inside play area, a larger outdoor walking area for the pets, and an enhanced Owner’s Lounge. Cunard will also install a lamp post and a fire hydrant inside the dog walking area; features that were included originally aboard Queen Elizabeth 2 and originate from suggestions made by the Duke of Windsor. 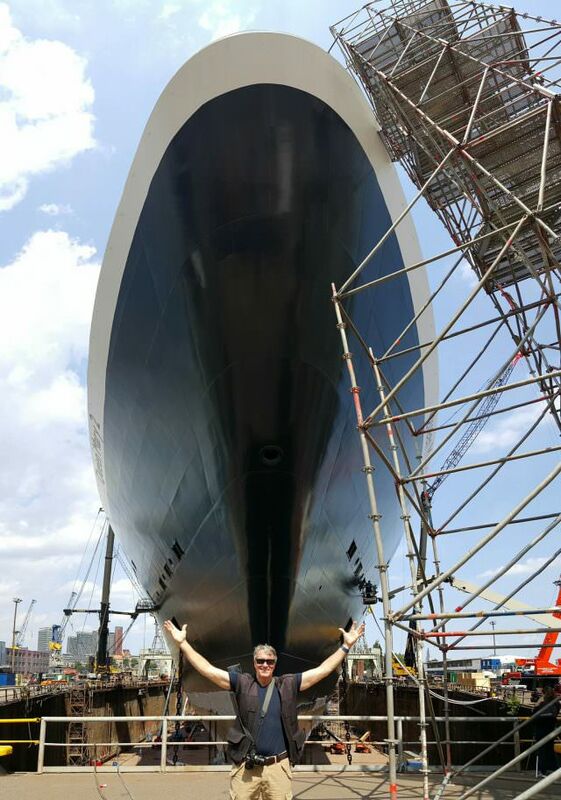 The opportunity to see Queen Mary 2 undergoing her makeover was a privilege. 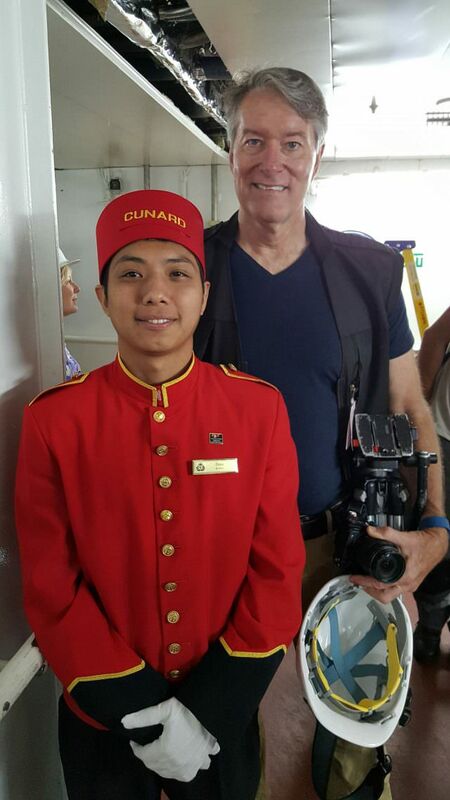 Seeing the scope of the project made me realize the significance of Cunard’s investment in its flagship. I can’t wait to see her when all the work is completed. She was beauty when she came out in 2004, and these refinements will make her even better than she was when she debuted.